Circulating Now welcomes guest blogger Lewis L. Barger III, who shares the story of Medal of Honor Recipient and Surgeon General’s Librarian Colonel Paul Frederick Straub in honor of Veterans Day. Mr. Barger is a historian in the Office of Medical History in the Army Medical Department Center for History and Heritage. The predecessor to the National Library of Medicine, the Library of the Army Surgeon General’s Office, did not have a librarian formally appointed to oversee it until after the Civil War. Surgeon General Joseph Barnes gave the responsibility of managing the collection to John Shaw Billings in 1865. Over a 30-year period Billings built the small SGO Library into a repository of medical literature recognized internationally as one of the great medical libraries of the world, a record of transformational leadership unmatched by any librarian since. One of Billings’ relatively unknown successors was Paul Frederick Straub. This is not to say that Straub was not diligent in his duties, but serving just over three months in the position in 1919, there was little opportunity for Straub to have a significant impact. Straub retired to California after his brief stint as librarian director, where he lived another 18 years. His short assignment is something of a mystery, as is Straub himself. Were it not for one distinguishing fact about his military career, he might go overlooked entirely in the history of the library, but that fact is worth noting. 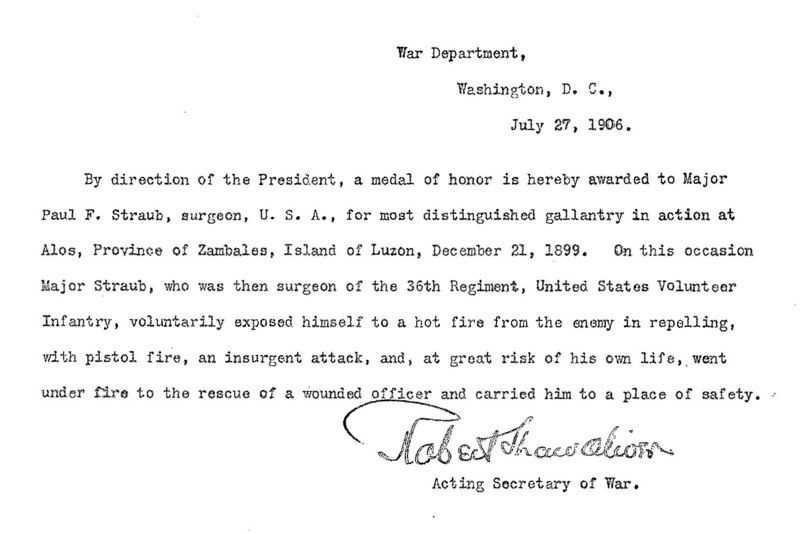 Paul Straub was the only SGO chief librarian who was a recipient of the Medal of Honor. In 1865 Straub was born in Vöhrenbach, a small town in Baden, Germany, before his family emigrated to the United States. He received medical degrees from the University of Iowa in 1886 and the Royal University of Berlin in 1892. In 1894 he entered the Regular Army from Iowa and was appointed a first lieutenant and assistant surgeon in the Army Medical Department. During the Spanish-American War he served initially with the Regular Army and, after the conclusion of the war, joined the 36th Volunteer Infantry Regiment. Straub was first noted for valor on the battlefield near the end of the Spanish-American War during the campaign to take Manila. On the 5th of August, 1898, an outpost of the 23d Infantry was attacked at night and Straub volunteered to go forward “under a heavy fire of musketry and artillery,” where he assessed the casualties and treated the wounds of five men. The commander of the 23rd Infantry, J. F. French recommended Straub for a brevet promotion to major, but nothing came of it. The following summer Straub accepted an appointment to the 36th US Volunteer Infantry Regiment as a major. The Philippine Insurrection was heating up. Filipinos who had expected independence after the Americans cast out their Spanish masters were unhappy to learn that America had its own ambitions, taking possession of the Philippines at the conclusion of the war. Fights tended to be small and local, but exceptionally fierce. On the 21st of December, 1899, Straub, lieutenants William C. Read and Pegram Whitworth, and the regimental commander, J. Franklin Bell, were traveling on horseback at the front of a column of scouts near the village of Alos on the island of Luzon. When they encountered a group of insurgents about 100 yards beyond a small ravine, Bell directed Straub and the lieutenants to take cover in the ravine and hold the insurgents back with their pistols while he went back to bring up dismounted troops and a mounted detachment. Rather than taking cover, Straub and the two lieutenants rode through the ravine and over the far bank where they stood in their stirrups, firing their revolvers at the insurgents. Read was shot in the thigh and Straub immediately leapt from his horse, caught the lieutenant in his arms before he could fall to the ground, and dragged him back over the lip of the ravine where he tended to the lieutenant’s wound. Despite the fact that they disregarded his orders, Bell was so impressed with the bravery of all three officers that he recommended them for the Medal of Honor. Bell also recommended Straub be brevetted to lieutenant colonel. Again, no action was taken. Major Straub, who was then surgeon of the 36th Regiment, United States Volunteer Infantry, voluntarily exposed himself to a hot fire from the enemy in repelling with pistol fire an insurgent attack and at great risk of his own life went under fire to the rescue of a wounded officer and carried him to a place of safety. Not much is known about Straub’s career from the time he received his Medal of Honor until he was posted to the library, however he produced a few publications on medical topics. The Surgeon General tasked him to prepare a 186-page manual, A Handbook for Medical Officers in the Field, which was published in 1910. 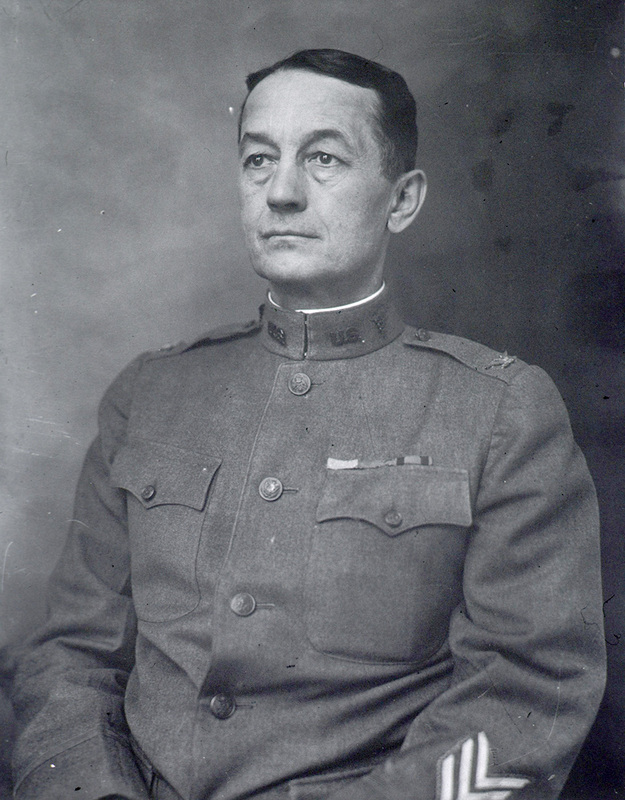 During World War I Straub was assigned as the Northeastern Department Surgeon from 1917-1918. But why was he then assigned as the librarian? And why for only three months? After World War I ended personnel management presented a significant challenge for the Medical Department. The majority of those who had volunteered or were drafted now wanted to return to their homes as swiftly as possible. At the same time, the personnel officers needed to ensure that hospitals still caring for the sick and wounded were adequately staffed, and that as those hospitals closed, the medical personnel were reassigned to a position where their expertise could be useful. Straub’s tenure as chief librarian was a brief interlude among busy luminaries such as Champe McCulloch (who had gone overseas to begin collecting materials to support writing the multivolume history of the medical department’s role in the war) and Fielding Garrison (author of the Introduction to the History of Medicine, the first comprehensive American treatise on the history of medicine). Straub was assigned to the library in late January or early February and retired on the 6th of May 1919. Colonel Paul F. Straub retired to Los Angeles, living there until he died on November 25, 1937. While he may not have had a significant impact on the library during his brief tenure, he is notable for being the only Medal of Honor recipient who has served as the Surgeon General’s chief librarian. Disclaimer: The views I am expressing are mine alone and do not reflect official policy or position of the Department of the Army, Department of Defense, or the U.S. Government. Acknowledgement: The author would like to thank Laura Jowdy, Archivist of the Congressional Medal of Honor Society, for making available copies of the original documents pertaining to the award of the Medal of Honor to Paul Frederick Straub.